It has been one hell of a busy week on this end and I've had a million and one things to do, including blogging, but I fell behind on pretty much everything so be patient with me while I catch up with it all. After my last NOTD post, I thought I was going back to dark colours because I loved the navy nailpolish and was about to start embracing the darkside again but that was until I spotted this nailpolish in my drawer. 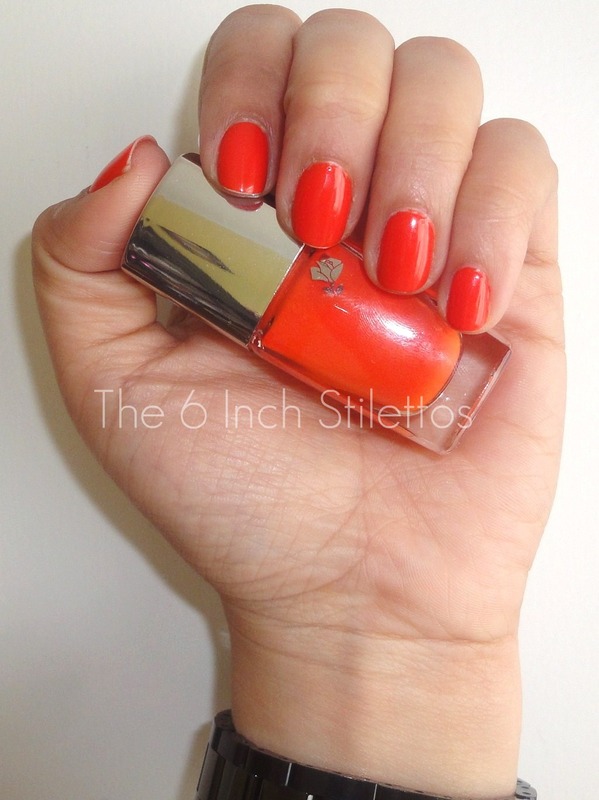 Orange Fluorama by Lancome is the perfect summer nailpolish and is so eye catching that people can't help but stop and ask what colour it is I'm wearing. I kid you not, since I painted my nails two days ago I've had 4 people ask me which shade it is that I'm wearing. I love Lancome products and nailpolishes as they have some really pretty colours and have great consistency but I did have some trouble with this shade as the first two coats were quite thin and streaky. It took three coats (the last one being relatively thick) to get an even finish on all nails but at the end of the first day I was already seeing tip wear. That is a downer for me because as soon as I see the white of my nail peep through from under the nailpolish, it makes me want to change it. The only reason I haven't changed this one is because I LOVE this shade but I'm going to try and find a similar shade by a different brand to see if the difference. If you know of any similar colours to the one in the photo, please drop it in the box. I think Barry M have something similar so that be my first point of call but let me know if you have any other suggestions. But just on the right side of neon. Would love to see this on toes. Bet it looks gorgeous. I think I might just try that. Don't expect to see photos of feet on here though... That's just nasty!